According to the World Health Organization, by 2020, the majority of diseases worldwide will be caused by chronic pathologies such as diabetes, hypertension or cardiovascular conditions (see Figure 1 on the following page). The treatment of such diseases requires frequent and expensive care. Mr. Shivaji Chatterjee is the Business Head of the Enterprise Business Unit at Hughes Communications India Limited (HCIL). He leads the functions of the Enterprise Business Unit that encompasses various aspects of sales and marketing, operations and program management at the company. The annual ‘Big Four’ gathering at the recent satellite show in Washington D.C. (SES’ Romain Bausch, Intelsat’s Dave McGlade, Eutelsat’s Michel de Rosen and Telesat’s Dan Goldberg), delivered some powerful, home truths to the industry. Each of these luminaries combined to praise the innovation that’s come from Elon Musk and his SpaceX low-cost rocket venture, saying the degree of imagination and fresh thinking that’s come from Musk was a benchmark that fellow rocket builders—and satellite suppliers—need to embrace. Marc Eisenberg joined ORBCOMM in 2002 and has served in a variety of roles, beginning as the Executive Vice President of Sales and Marketing. Mr. Eisenberg was promoted to Chief Executive Officer in 2008. Over recent years, there has been a great deal of focus on the implementation of Carrier ID, in part, because it is an extremely effective tool for mitigating interference, by pinpointing the source quickly. 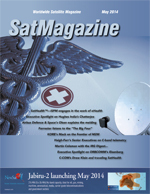 Airborne Antenna Considerations For C-Band Telemetry Systems, By David Farr, Chief Executive Officer, Haigh-Farr, Inc. and Dr. William Henderson, Chief Technology Officer, Haigh-Farr, Inc. The changeover of many test ranges from S-band to C-band telemetry implies the need to modify or replace current systems. Several antenna-related issues need to be considered in order to facilitate a smooth transition to C-band. Among these are changes in vehicle-induced pattern degradation, the effect of increased propagation loss on link budgets and the potential need for multi-band antennas that also support legacy systems during the transition. More than ever, companies rely on broadband access, with high quality voice, video and data to successfully operate their businesses. From communications to research; from database management to disaster recovery; two-way, high-speed Internet is an absolute must no matter the location. This is especially true in the emergency medical field where access to communications is crucial as lives are at stake.